The Startruck is a fully equipped Ford F250 Supercab 4x4 with a R.C. 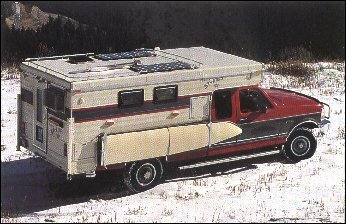 Willett "pop-up" PickUp camper. This sporting vehicle has been designed for the off-road outdoorsman engaging in fishing and hunting trips. In order to increase the appeal of these traditionally confined quarters, the Startruck applies the latest in new DC technology including the solar charging system to make these vehicles more livable. On the Michigan Upper Peninsula, late October, with a flat angle, recorded a 5 amp input to the battery bank. November, in northern Wyoming, recorded a 7 amp input at mid-day.